In the depths of winter, when Puget Sound is socked in with drizzle and fog, remember what sits up there above the marine layer: Nestled among glacier-capped peaks of the Cascades and Rockies are a dozen or so fantastic snow towns. On any winter weekend, you can load up the car with kids, down jackets and skis, and in just a few hours be checking into a cozy lodge suite, where the wood fire is already stoked and the cocoa mugs prewarmed. Even if skiing isn’t on the family-fun list, you can sled, skate and wage snowball fights to your heart’s content. What’s the foolproof recipe for finding your family’s favorite snow town? Look for these ingredients: 1) a charming Main Street that’ll have you feeling you’ve strolled onto a holiday postcard; 2) proximity to winter adventures for all ages; 3) a family-friendly après-ski scene, even if it’s just sipping hot drinks and playing games beside a roaring fire; and, of course, 4) reliable snowfall throughout the winter months. Here’s our guide to three of the most family-friendly powder-coated alpine villages in the Northwest, with insider tips for making the most of your visit this winter. 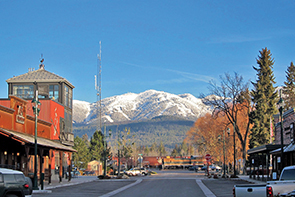 Known as “Stumptown” to locals (it’s the town’s original name), Whitefish, Montana, is an unpretentious town where outdoorsy residents take full advantage of easy access to the semidry powder, numerous groomed runs and open forest glades. A gateway to the west side of Glacier National Park, this über-pretty Rocky Mountain village hosts hordes of hikers and mountain bikers in summer months. But in winter, when the town is swathed in snow in its location at the base of a terrific ski resort, tourism is light compared to other well-known western ski towns like Sun Valley or Vail. The rewards are yours: short lift lines, nicely priced lodge rooms, dozens of terrific eateries and stunning scenery in relative solitude. The scene: Less of a ski resort and more of a real mountain town, where small restaurants, cozy cafés and the mountain’s ski glades host as many locals as tourists. Kids will love: Taking a horse-drawn sleigh ride through the snow at Bar W Guest Ranch, just west of town. Four-person minimum; cozy blankets and hot beverages provided. Reserve here. Non-skiers will love the two-hour, ranger-led snowshoe walks from the Glacier National Park Apgar Visitor Center (free walks depart twice daily on Saturday and Sunday; ages 6 and older). Breakfast like a local: Debate powder versus crud with locals over huevos rancheros or a stack of buttermilk pancakes at The Buffalo Cafe. Brew with a view: Head upstairs at Great Northern Brewing Company (that’s where the tables with great views are) and order the flagship craft lager, made with local hops and handpicked Montana huckleberries, gourmet sandwich baskets and kettle chips. Don’t miss the kid-friendly game room with shuffleboard and darts. Post-slope shopping: Browse the Western-style downtown and end up at Stumptown Marketplace, a rustic indoor mall where you can sample artisan cheese, share a gooey cinnamon roll, stock up on fine teas and buy in bulk at a candy store. Time your trip: For more than 50 years, the Whitefish Winter Carnival has celebrated the snowy season with parades, a kids’ carnival, fireworks and frivolity (Feb. 1–3, 2019). Stay: The Lodge at Whitefish Lake boasts an indoor pool framed by a rock waterfall and a grand Northwest-style communal lobby for playing Scrabble beside a roaring fire. Spacious lodge rooms feature a gas fireplace, TV and Wi-Fi (rates from $200 for a family of four, with suites and condos also available). Get there: Whitefish is a nine-hour drive from Seattle (mostly on Interstate 90 headed east), but Alaska Airlines flies directly from Seattle to Glacier Park International Airport daily. Or, for the quintessential winter adventure, ride the rails from Seattle to Whitefish and soak in the scenery on Amtrak’s Empire Builder train. At nearly 3,200 feet, this Wild West–themed mountain town enjoys regular fresh blankets of snow in winter, so if you’re dressing like the locals, you’ll want to make sure your cowboy hats and boots are waterproofed. While the downtown wooden boardwalks and Old West storefront facades are mostly for the benefit of tourists like us, Sisters’ 19th-century vibe isn’t a total gimmick — the town was established way back in 1888 as a pioneer stagecoach pit stop. Today, it’s a gateway to backcountry and downhill skiing, snowshoeing, hiking and fly-fishing. Sisters, about a six-hour drive from Seattle, is 22 miles northwest of Bend, Oregon, and straddles the high desert to its east and Cascade alpine country to its west. Its name hails from the trio of skyscraping, snowcapped volcanic peaks (known collectively as Three Sisters) that provide a stunning backdrop to your visit. The scene: An Old West aesthetic permeates every shop and saloon in this throwback town. Kids will love: Hoodoo’s great beginner terrain and rustic day lodge with board games, foosball, pool tables, snacks, hot cocoa and comfy, overstuffed couches for lounging. Post-slope shopping: Stroll the wooden sidewalks of Sisters to pop into art galleries, specialty shops and the always-bustling mercantile. Like a local: Order a latte and croissant at Sisters Coffee Company and take a seat on the leather sofa beside the huge river-rock fireplace. After admiring the vast taxidermy collection on the wall, vintage sleds and wagon-wheel chandeliers, catch up on your reading or just listen in on the local gossip. Nachos and craft beer: Central Oregon deserves its reputation as the craft beer capital of the Pacific Northwest, especially renowned for hoppy pale ales, and Three Creeks Brewing Co. rules that roost in Sisters. This family-friendly brewpub has great burgers and appetizers, and it steps out of the brewpub box with items such as Thai spring rolls and gluten-free pasta Alfredo. Stay: Stroll to restaurants and galleries from your vintage-vibe suite, with kitchenette, at Sisters Motor Lodge, a locally owned and operated motel downtown. The decor features plenty of quilts and throw pillows, but is tastefully cozy, not frilly or cluttered. And you can bring your dog (from about $150). Get there: Sisters is about a six-hour drive from Seattle, or catch a one-hour flight from Seattle-Tacoma International Airport to nearby Redmond, Oregon. Leavenworth, that faux Bavarian town set in a scenic corner of the craggy Cascade foothills, might feel almost too familiar to Seattle-area families. But at just a two-and-a-half-hour drive from the Emerald City, the winter fun per mile driven can’t be beat. With a nearby ski area, a sledding hill (and unofficial sledding in town), family-friendly hotels and restaurants, it offers snow fun for all ages. While this mountain town really turns the storybook charm to full throttle for the snow-laden holidays, it's just as great during the rest of winter, too. Kids will love: The Gingerbread Factory in downtown Leavenworth, where you can pop in for just-out-of-the-oven gingersnaps, snickerdoodles and steaming mugs of cocoa, and then marvel at the intricately decorated holiday gingerbread houses (available for sale). Snow fun: A little more than a mile north of downtown is Ski Hill, a unique hub of various snow activities just right for the pint-size set. It includes snowshoe trails and two alpine runs (day passes from $15; ages 5 and younger free), and a fun tubing hill (tubes provided; $20 for all ages gets you 90 minutes), both serviced by rope tows. A small lodge serves hot cocoa and other steaming beverages. On the west end of Leavenworth is the region’s most popular and kid-friendly groomed Nordic ski area, the easy, scenic Icicle River Trail system (day passes from $15; ages 5 and younger free; find info on both ski areas here). 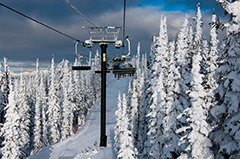 For a big resort experience, drive just 40 minutes to Stevens Pass on Highway 2, with great deals for families (kids 6 and under ski free) and extensive network of runs. For non-ski thrills, bring your plastic sled to slide down the short but sweet hill at Front Street Park; or book a ride along the Icicle River on a horse-drawn sleigh operated by Icicle Outfitters & Guides (about $10 per kid and $20 per adult; daily December–February) and kids 2 and under are free. Worth the line: Don’t shed your down coats just yet — part of the fun of noshing at München Haus in winter is enjoying your hot bratwurst with a side of apple cider kraut on the outdoor patio (toasty wood fires and heaters take the chill off). Save room for a warm Bavarian pretzel you top yourself at the incredible mustard bar. Hand tossed: If your idea of family dinner is sharing a giant pizza pie, head to Leavenworth Pizza Company. Its house-made pizza sauce recipe is so good, it’s kept a well-guarded secret. Post-sledding activity: Tucked in among the cute shops that peddle music boxes and Swiss chocolates in downtown Leavenworth is the must-visit Nutcracker Museum, where more than 5,000 nutcrackers on shelves and in glass cases beckon the curious for a closer look. Time your trip: For maximum holiday cheer, aim for one of the first three full weekends in December, when the Lighting Festival is in full swing, featuring costumed holiday characters, handbell choirs, strolling carolers, roasted chestnuts, sledding, a cookie crawl for the kids and a Glühwein (hot spiced wine) tent for the grownups. Or head to the Bavarian IceFest (Jan. 19) for icy games, sculptures, sledding and more. Stay: In town, Bavarian Lodge is one of the best choices for families. The rooms are a good value (from $175), suites and fireplaces are available, and there’s a complimentary breakfast buffet and heated outdoor swimming pool and hot tubs. Get there: Leavenworth is about two and a half hours east of Seattle by car via either Interstate 90 or U.S. Highway 2. McCall, Idaho: The slopes of Sun Valley may get the celebs, but no-glitz McCall and its two ski resorts (downhill and cross-country) draw powder hounds who prefer wide-open slopes and no lift lines. McCall’s epic Winter Carnival (starts Jan. 25, 2019) is ten days of intricate snow sculptures, dog sledding, snow bike races and parades. 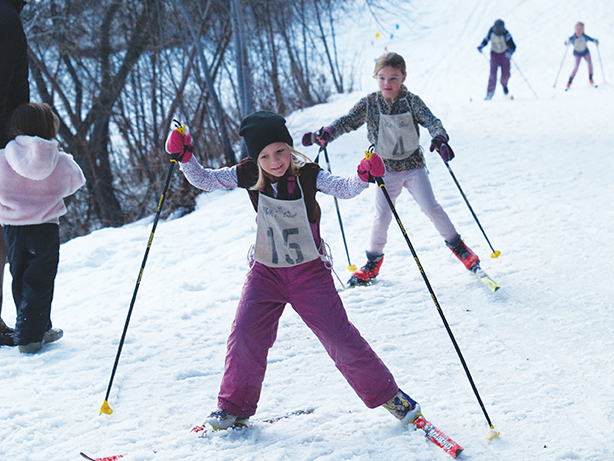 Winthrop, Washington: A great choice for families that love cross-country skiing, the Methow Valley boasts more than 120 miles of Nordic trails (some groomed, from easy to challenging). When you’re ready for a change of scenery, kids will love Winthrop’s open-air ice skating rink, and parents appreciate the delicious coffee at Rocking Horse Bakery. Baker City, Oregon: It’s the nearest town to Anthony Lakes ski area, blanketed in powdery, fluffy snow that’s a rare treat for Northwest skiers. The historic Geiser Grand Hotel downtown is the place to stay; its huge rooms with soaring ceilings have been restored to its original 19th-century glory. Draft horses lead sleigh rides, while passengers peep at Christmas lights downtown during the holidays. Nelson, British Columbia: If your kids already consider themselves to be powder heads or shredders, take them to Nelson, a truly authentic mountain town that retains a throwback ski-bum vibe hard to find these days. Set along B.C.’s “Powder Highway” through the Kootenay Rockies, Nelson is home to the little-known but much-beloved Whitewater Ski Resort. Editor's note: This article was originally published in 2018 and updated for 2019.